The M N Resort is nestled in the foothills of Arpora, within 1 km of the popular Baga Beach and about 100 metres from the well-known Saturday Night Market (Mackie’s Night Bazaar). M N Resorts is located only 5 km from Calangutte Beach. 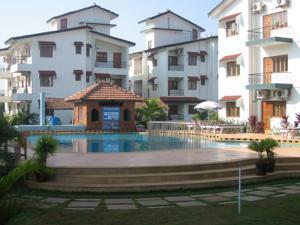 It is situated about 46 km from Dabolim Airport, while Thivim Railway Station is only 6 km away. The tour desk helps guests organise excursions to tourist attractions. The rooms are spacious and provide free Wi-Fi. They are air conditioned and equipped with a writing desk, a flat-screen cable TV and an en suite bathroom. The villas also have separate living areas. R.E.D Restaurant serves a selection of Indian, Chinese and European dishes. There is a bar which offers a selection of refreshing beverages. Guests can also enjoy their meals in the privacy of their rooms. Free! One child under 5 years stays free of charge when using existing beds. One older child or adult is charged INR 1300 per night and person in an extra bed. One child from 6 to 12 years is charged INR 850 per night and person in an extra bed. Maximum capacity of extra beds in a room is 1. There is baby beds in a room is 0 capacity for cots in the room. Supplements will not be calculated automatically in the total costs and have to be paid separately in the hotel. Visa, Euro/Mastercard, Maestro The hotel reserves the right to pre-authorize credit cards prior to arrival.